I've been listening to a great audio lecture course on the concerto put out by The Teaching Company and taught by the exuberant, entertaining and educational, Professor Robert Greenberg. If you can find any of his audio courses at your library, I highly recommend them! 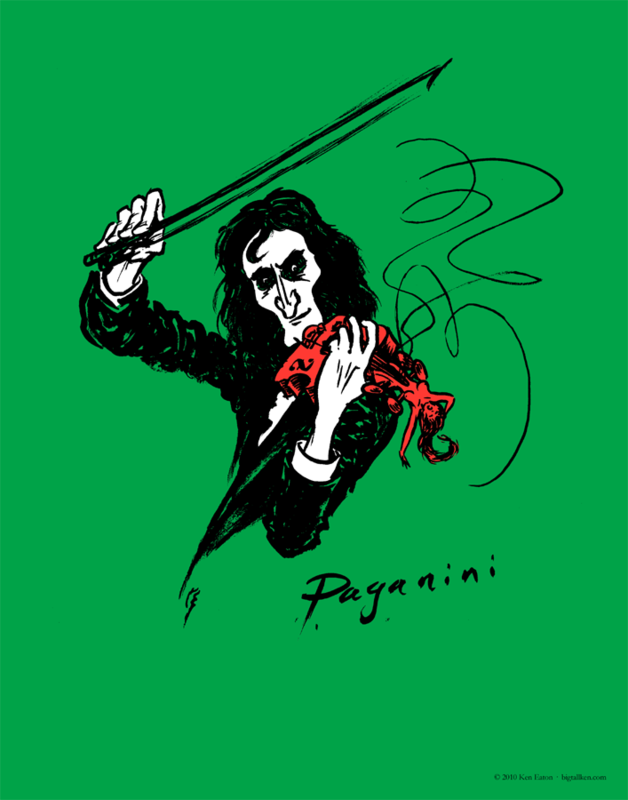 In the lead off lesson about the Romantic era of the concerto, Niccolò Paganini (1782-1840) was the violinist and composer who set off the trend of the instrumentalist virtuoso as hero. When Greenberg quoted a description of him so vivid and colorful I had to draw him! Dressed in black, skeletal features, long black hair with a playing style so extraordinary that people believed he had sold his sole to the devil - too juicy! One of his gimmicks was to play a piece on a single G-string after breaking the other three strings and playing in the highest register of the violin. 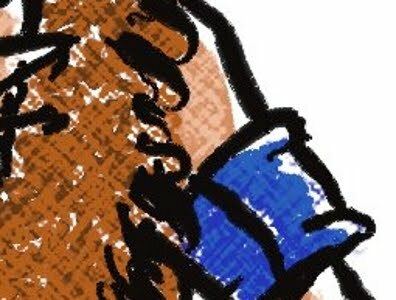 In my illustration I left the E-string being held by his little finger. It seemed a bit more dramatic to me, but I'm not a musician. 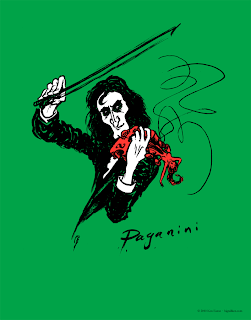 While researching Paganini it is thought he had Marfan Syndrome, which could explain his ultra-flexible fingers and gaunt appearance. Abe Lincoln suffered from this as well. It is a genetic disorder and generally seems to affect tall people as explained in "The Tall Book". So I am going out on a limb that Paganini was several inches taller than average for his time. If I'm wrong, what of it? He stands tall as a pivotal musical figure! There are several performances of Paganini's music on YouTube. To get an idea of how dexterous these players are turn off the sound and just watch the violinist's fingers and be amazed! This is available as a poster in my Zazzle store. It sounded like Paganini also had a way with women, contracting syphilis as a result. The treatment of which rotted his jawbone and added to his spectral features. The description in the lecture also mentioned deep blue tinted spectacles, which I wanted to add but decided it was too distracting from the violin. I wanted to capture the sensuous aspect of the violin and the violinist's fingers in action. 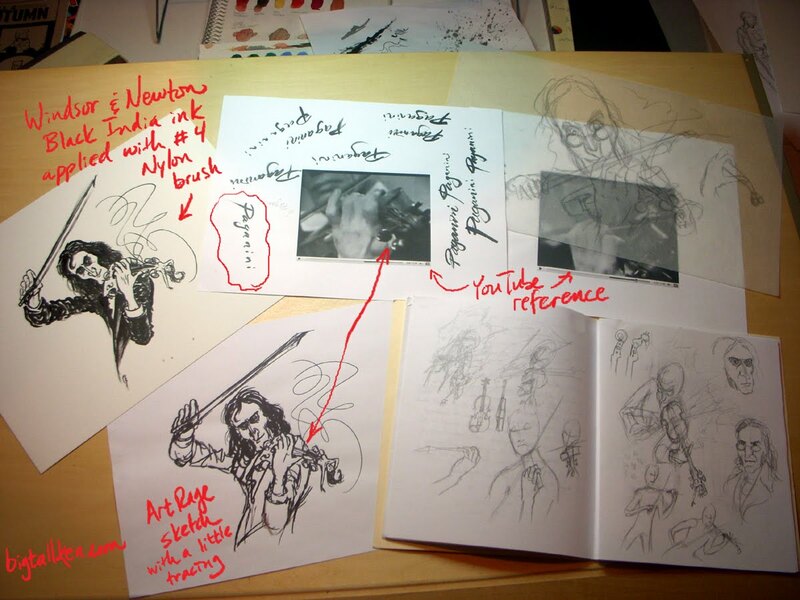 The most difficult part was drawing the violin in deep perspective and the fingers. In addition to the notes below I also found a 3D violin in Google that helped, and posed in a mirror playing a T-square instead of a violin. The arch of the devil-woman's back in place of the scroll throws off the balance of the violin, making it droopy looking, but I stuck with it anyway. There are even more sketches than these. Enjoy! "Being 6'7", do you have tall parents?" you ask (as others have). Yes, I do. My dad was 6'5" and my mom is 5'10". So in this Tall Tuesday, I honor my dad. I'll decipher some of the imagery for you. He worked in the accounting field but also had a creative side. He loved working in the yard and garden. 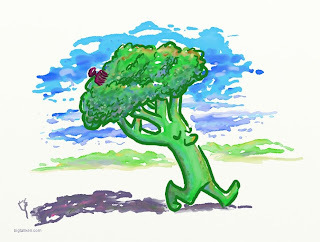 Setting up flower beds, creating a fish pond and waterfall and sculpting bulky juniper bushes into shapely bonsai were just a few of his feats. When gardening he used to where some old college sweatshirt that was worn ragged and faded into some nondescript shade of mauve. A cup of iced tea was always handy in a green plastic cup. His old army boots had lost all their tread and were stained from years of treading wet grass. Behind him is a reproduction of Picasso's "Woman Dressing Her Hair" that he painted in high school and now hangs in my basement. 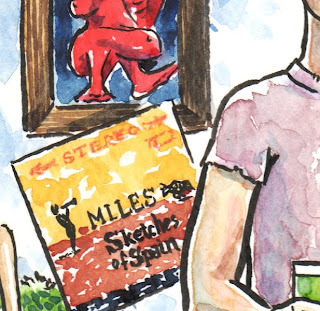 He also had a large collection of jazz records from the 60's that were kept in pristine condition: Miles Davis, Cannonball Adderly, Dave Brubeck and many others. 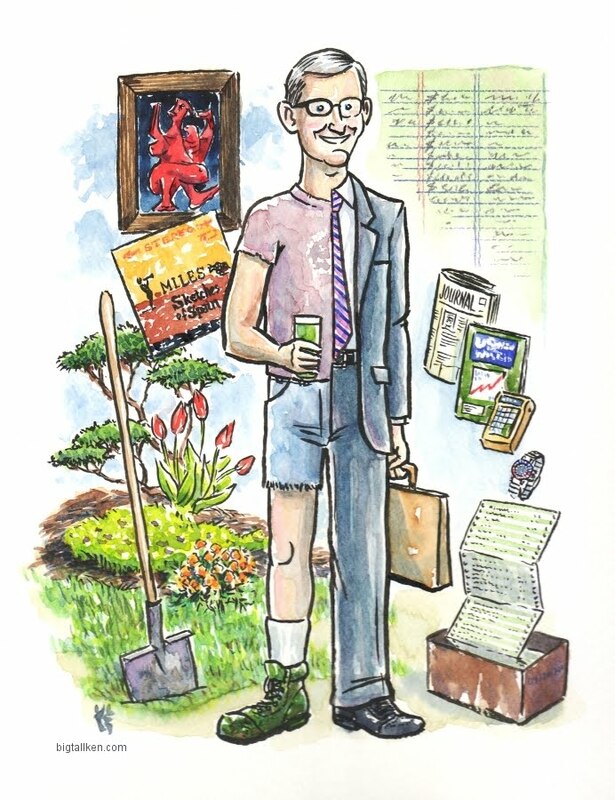 Dad loved tracking the stock market. 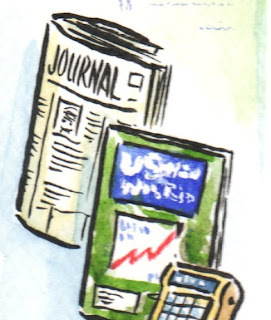 "The Wall Street Journal" and "U.S. News and World Report" were standard reading material. As a kid I used to love playing with his electronic calculator with it's futuristic blue lit text. He had a favorite watch that was worn at all times and made a very distinct sound when shaken. Last is a box of computer print outs he brought home that was my drawing paper for years and years growing up. My sister reminded me of his love of sailing and windsurfing, but it was too late to fit into the composition. I'll follow up about the art later. For now here are two detail views. 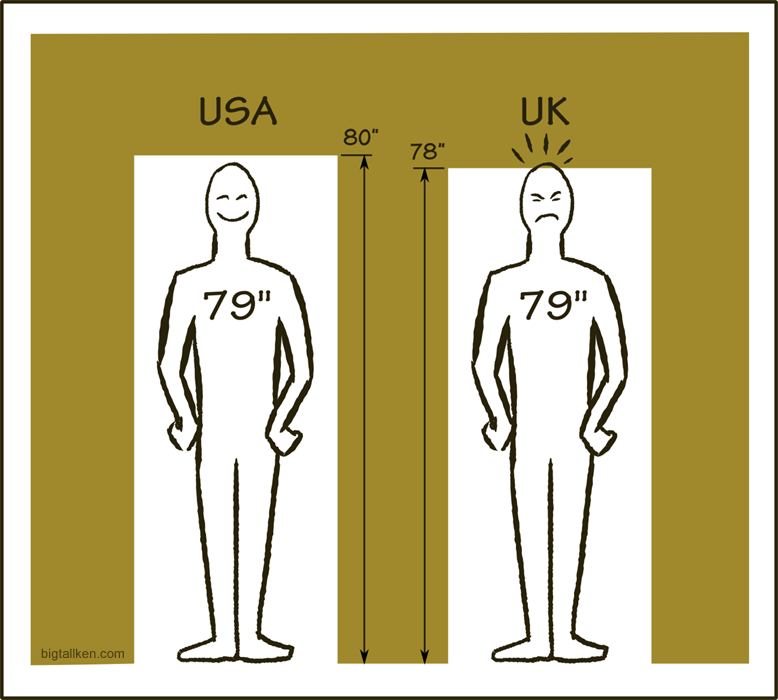 Being 6'7" I've learned the hard way that there is a difference between standard door heights in the U.S. and Europe. 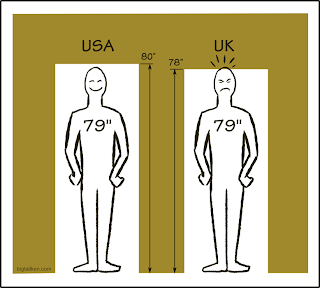 When I stand straight under a standard door in the U.S. my hair just brushes the top of the door jamb, which is 80" high. Years ago I periodically travelled to the U.K. and Germany for work and found myself ducking under typical interior doorways. I have since learned the standard door height over there is 78". One time as I was exiting a bathroom stall I forgot to fully duck under the steel door frame and scalped the top of my head, drawing a little blood, which was both embarrassing and painful! Many old (over 200 years) European doors are significantly shorter than 78". I can only imagine how many people bumped there heads as the population's average height increased. I created this using Inkscape and tried to emulate those old two color technical graphics from the 50's and 60's. I found Inkscape to be very clunky to use compared to Illustrator for this. Some of this is due to having much more training in Illustrator. I do like the calligraphy tool better in Inkscape, which I used to draw the figure. I was trying to make another illustration involving the bathroom stall in the same manner but ran out of time trying to figure out the best combination of Inkscape, Illustrator and Photoshop to use. In the future I'll stick to drawing with real ink and converting to vector art. Drawing straight into vector format just doesn't come as natural to me. 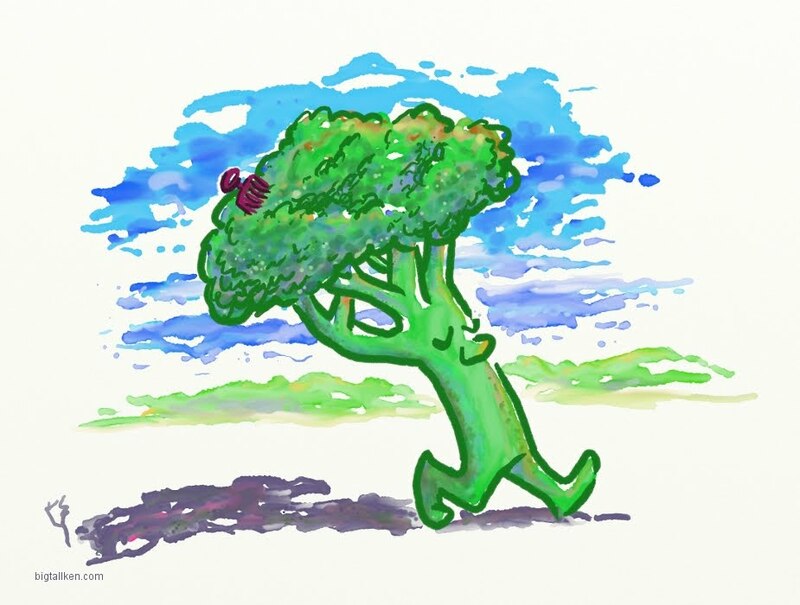 I did this sketch at lunch using the marker and watercolor tools in ArtRage3 Studio Pro. It took some experimenting but I was able to pull off a somewhat natural watercolor look with it. 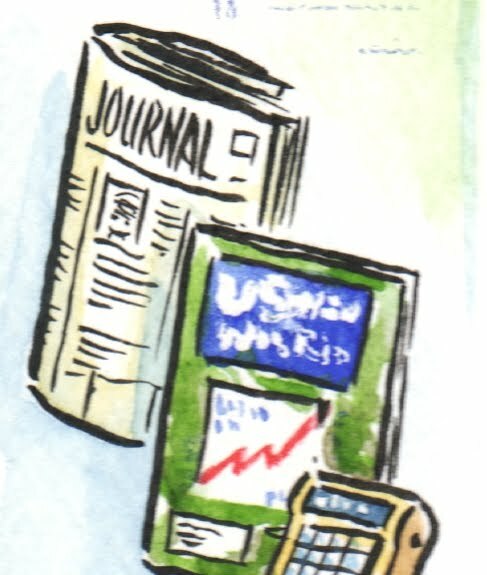 It helps to have worked with real watercolor to have some idea of how colors can run together if you want to replicate watercolor's unique attributes. One trick is to squiggle the stylus and "skip" off the tablet with little randomness to make it appear that the color is "running" or make it look like a real brush was skipping across real paper. It's a little difficult to lay colors on top of others in the wet mode. I was constantly adjusting the amount of thinning to either add color on top of the existing or smudge it out. By lightly tapping the tip of the stylus I could create a light spatter effect. It's also difficult to create a sweeping wash with a brush over 100% in size as the computer really bogs down. It also helps to mix in some complementary colors for variety. I created this at 300 dpi and it printed out quite well. I found the original report that Arianne Cohen references in her book about the U.S.'s decline in average height. You can download a PDF of the full report with the statistical data and graphs here. The report is by John Komlos and is titled, "Underperformance in affluence: the remarkable relative decline in American heights in the second half of the 20th-century." "Conclusion: We conjecture that the American health-care system, as well as the relatively weak welfare safety net might be the reason why human growth in the United States has not performed as well in relative terms as one would expect on the basis of income. The comparative pattern bears some similarly to that of life expectancy insofar as the US is also lagging behind in that respect." 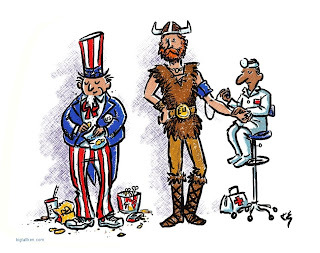 All of the countries taller than the U.S. have some form of universal health care. Having travelled to Europe they generally eat smaller portions and walk much more than Americans due to the layouts of their towns and cities. 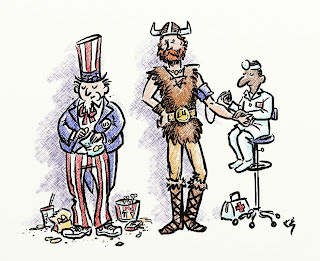 So for all those opposed to the new health care reform, think of it as trying to grow Americans to their full potential! It was all done in ArtRage3 Studio Pro. 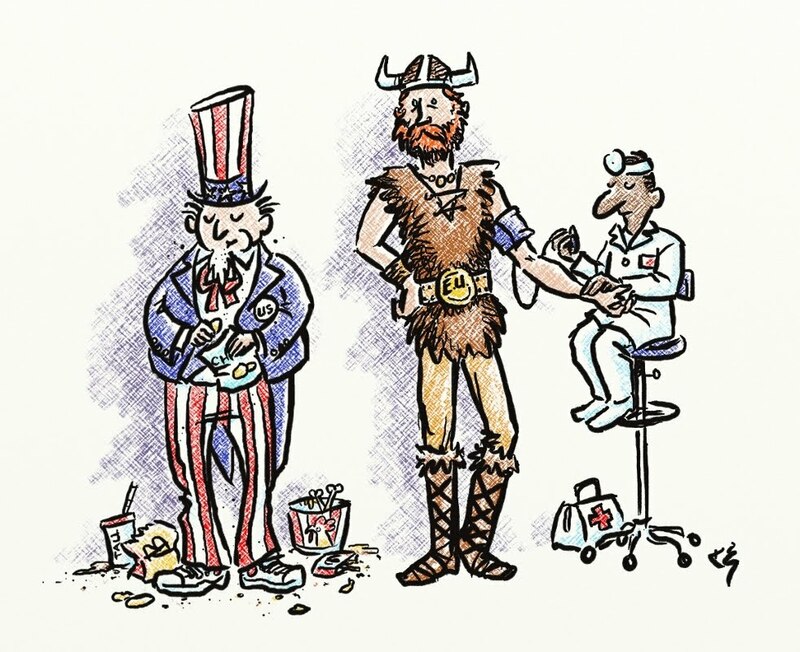 I was going to do a line up of an American Bald Eagle, a crowned lion to represent several of the Scandinavian countries and a black eagle for Germany but opted for the viking and Uncle Sam instead. I'm continuing to experiment with coloring. The color was added with the pastel tool over a diagonal hatched paper texture. The inking was done with the marker tool set at 96% pressure, 75% softness and 15% wetness. Once again I've updated the art. I thought the pastel with the ink looked to blah. So I added a layer underneath the pastel and added more color with the marker tool. Here is a detail of the result. 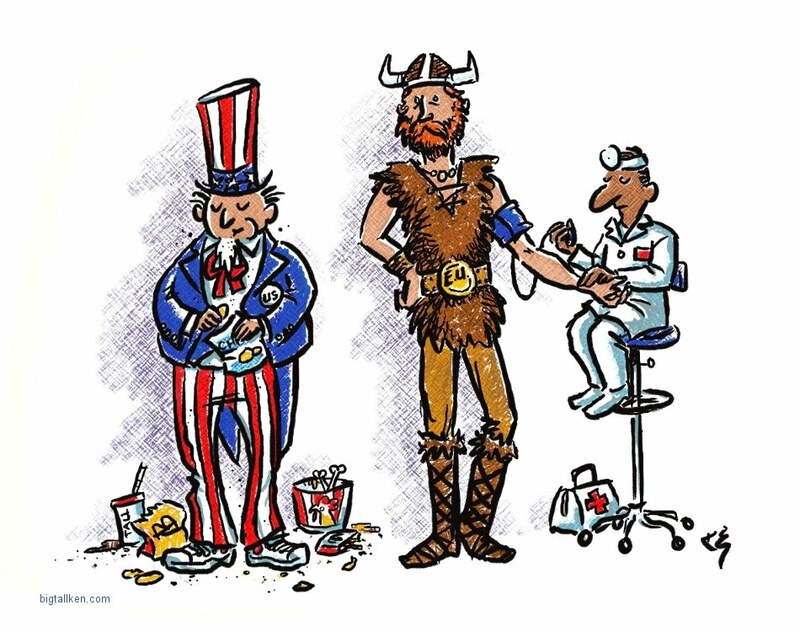 When looking for Uncle Sam references I came across this image. 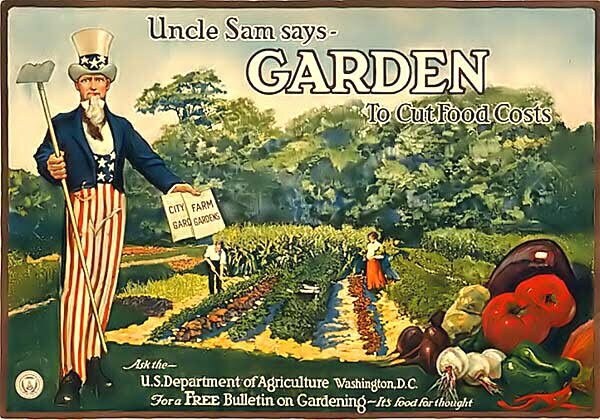 It was created by the U.S. Department of Agriculture in 1917 during World War I. 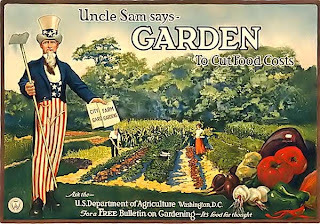 It wouldn't be a bad idea to bring these kind of posters and ads back in support of Michelle Obama's war on obesity, but it would probably be killed by the agribusiness lobby and Tea Partiers who would call it socialist and part of the liberal totalitarian government. That being said Big Tall Uncle Ken says, "Chow down on those fruits and veggies today!"